Three ways to cope with difficulty in the world around us. One way of handling an unjust or seemingly impossible situation is to pray for deliverance and guidance from God on how to get out of this mess. It’s a metaphor: when things go bad, we often feel helpless and turn to God for help and guidance. We can hope that God will guide us to the right path (“Jesus, take the wheel”) because we just don’t have any way out of this mess. Sometimes we cannot see our way through a situation and so we can pray that the wheel be in God’s hands. One way of handling injustice is to simply pray for deliverance and guidance from God on how to get out of this mess. Sometimes when we see danger, we need to attempt to take ahold of the system and stop it from hurting people. If I see a madman driving a car into a group of innocent bystanders, then I can’t simply wait for the catastrophe and then comfort the wounded and bury the dead. I must try to wrestle the steering wheel out of the hands of the driver. For Bonhoeffer, Christians have a responsibility to not just help those experiencing harm, but oppose those causing harm. When people use the system to cause harm, then Christians need to remove them from the system or enable the fail-safes/checks-and-balances of the system to minimize or stop the harm. And when that fails, then even a pastor like Bonhoeffer considered assassination. One way of handling injustice is to advocate removal of the people who use the system to harm others. While not often as dramatic as assassinating Hitler, Christians are called to make sure the system works the best it can and to take the system away from people who use it to cause harm. Finally, sometimes, Christians must act in revolutionary ways to make sure systems of injustice and cycles of abuse are completely dismantled. She said this as she attempted to completely wipe out the old order of the GoT universe and…well, insert herself at the top of the new one. But the point of her comment is that the system didn’t work for people like her, so she needed to overthrow it completely. For Bonhoeffer, Christians especially have a responsibility not only to care for the wounded but to stop the wounding. This is different from his comment about taking the wheel of the madmen: this is about stopping the car altogether and dismantling it so it cannot be used by anyone. One way of handling injustice is to seek systemic change and re-do the way how it interacts with people altogether. This takes a lot of time and effort, but it can stop a system altogether given enough determination and societal change. 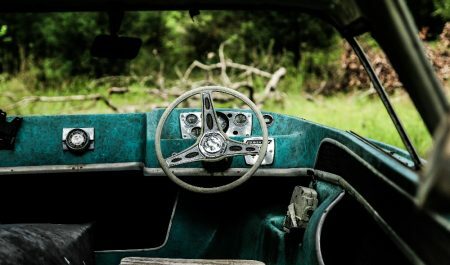 A steering wheel or a wheel in perpetual motion is a helpful metaphor to help Christians think through how to handle cycles of injustice or harm. It acknowledges both control over situations and the immense harm that comes from an out-of-control car or a perpetual crushing wheel. In Numbers 13, the Hebrew people had been liberated from Egypt and brought to the promised land, but they became afraid of giants in their way and started to not trust God. In response, God had them wander in the wilderness, a people without a place to call home, for 40 years. They were spinning their wheels for 40 years because they didn’t trust all that God had placed before them. This trust that God is wanting us to care for Creation and Neighbor should spur us to action. Christians are called to oppose injustice and to break the cycles of poverty and pain in the world around them. Sometimes this involves prayer for guidance and waiting until a path presents itself. Sometimes it involves taking action and wrestling the steering wheel away from the madman. Sometimes it involves upending the whole system itself and replacing it with something new. Otherwise, we are just spinning our wheels. My hope for you is that you engage the wheel, no matter how immense it is, and no matter how powerful the operator behind it, with a grounded ethic informed by community, scripture, and the voices of the oppressed at your side. Bonhoeffer wrote good stuff. His ‘Ethics’ and particularly his ‘Christ the Center’ are books I re-read all the time. The wheel is a good metaphor for the plight of LGBT people in the UMC, who have been under a crushing wheel of second class citizenship for over 40 years, spinning their wheels while praying for guidance and a way forward. Will the wheel be wrestled from those who have wounded their LGBT neighbors or will the whole UMC cart be upended in 2019? I had a debate with someone online. I stated that justice involves standing up for the oppressed and downtrodden. This person stated it only giving people what they deserve. Also, there can be some non violent means of taking control of the wheel. Exposing and publicizing can be means of doing this. For Christians, what people deserve is our love. Justice is but the public face of love, or love put into concrete action publicly. Such respect for all that Bonhoeffer wrote and all that he did as a Christian, and, of course, for his unending courage against the Nazis, even when in prison, and until they executed him. I would like very much to hear what Bonhoeffer would think about the exclusivity of, and the twisted Christianity with patriotism, so prevalent with Evangelicals today. PS Final words of their choice was not part of my message??? Ministry: A Blind Imitation of the Past? Sharing the What, Why, or How of Christianity?